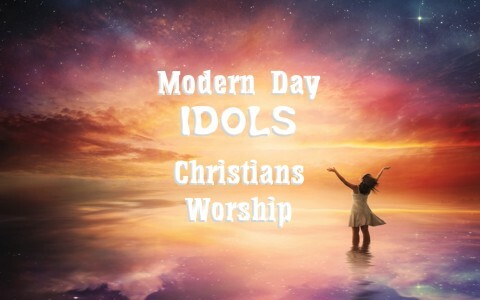 Do Christians really still have idols in their life? If so, what are they? I think that Jesus spoke more about money than nearly anything else because it is so close to our hearts. Jesus knows the human heart and knows that money can take over our purpose in life. When the rich young ruler came to Jesus, he boasted that he had kept all the commandments, which of course would not be possible for anyone but Jesus, so Jesus said to this man, knowing full well that money had his heart, Jesus tells him, “If you want to be perfect, go, sell your possessions and give to the poor, and you will have treasure in heaven. Then come, follow Me.” (Matt 19:21). I think most of us remember what happened: “When the young man heard this he went away sorrowful, for he had great possessions” (Matt 19:22). The man thought he was a good person, which we know is false because not even one is good, (Rom 3:10-12), so when Jesus found where his true treasure was, the man couldn’t let go of what was most precious to him. Archaeologists found human remains in Pompeii, Italy. They had been buried under volcanic ash from the Mount Vesuvius eruption in AD 79, and they uncovered a man who was reaching for a bag of gold coins, just by the front door of his house. Perhaps if he had fled fast enough, he would have lived, but apparently, he was trying to bring his gold with him, and both were buried alive. His gold could not help him on the day of his death, so sure it is true that, “where your treasure is, there your heart will be also” (Matt 6:21). In some cases, that’s where your body will lie. I know this sounds out of place, but not long ago I was invited to a large church in the next town. I had assumed that I was going to preach, but when I came in, they handed me a set of ear plugs. I didn’t have to ask why because I could already hear the music, and it was loud. In fact, most of the service was a show of music, lights, strobes, drums, guitar solos, and vocalists. The big screen had fast moving images and color schemes to go with the rhythm of the music. I thought I had a flashback to my first rock concert, long before I was saved, but I was most disappointed by the fact that there was no expository preaching or even reading of the Scripture. I looked around and saw sheep that were starving to death and didn’t even know it! Apparently, they couldn’t tell the difference between grass and artificial turf. Mind you, this was the same church that last Christmas had a giant 30 foot tall Santa Clause in their parking lot, inviting people to come in and rock with Santa. I’m not making this up. This church wasn’t interested in glorifying Christ, but in glorifying themselves, the musicians, the producers, the technicians, and the “sound men.” They were making their music worship services into an idol, and worst of all, there was no mention of Christ, although some lyrics spoke about Christ, but the music was so loud, and the choreography so wild, that I wondered why I had even brought my Bible. Many churches have bowed down to the contemporary worship style they like best, and at times, elevating the music or “performance” over and above Christ. I couldn’t wait for “services” to end. Maybe you have identified your own idol, but the thing is, we all have blind spots. We might not even know we’re spending far too much time on something and little or no time for God. Idols come in all shapes, sizes, and colors. For some, their idol might be a certain music star, an actor or actresses, but they can also include materialism, ego, shopping, jobs, social status, our children, our spouse, our car, our sports team, and even us. To be honest, I struggle with some of these things too, but there are times when a person has several idols, just like the pagans worshiped a different god each day. I have a couple of friends who spend so much time on Facebook that it’s become their idol, so they spend hours upon hours on Facebook instead of having their face in “The Book” (the Bible). Whatever you put ahead of God is an idol and God will not be pleased. If you can think of one that I’ve left out, please add it to our comment section. I know I must have overlooked some, but I think money is the big idol that captures most of our hearts, and it’s not just rich people that covet money…the poor can do it just as easily. Maybe you don’t’ even realize you have an idol, or maybe you’ve done better than most of us have and not had problems with idolizing something or someone, but whatever your idol is, nothing should come before our worship and adoration of God. He alone is worthy of worship. In fact, the word worship comes from the root word for “worth,” or “worthy,” and I can’t think of anything, or really, Anyone greater than God to worship, and in particular, Jesus Christ. I know of someone who is very close to my heart, that I feel has made nature an idol, and I know there is scripture, that says we will not find GOD, JESUS, in nature, even though HE did create it. But this person thinks that when going for a walk alone and yes praying, but will not go to church, as nature is church, and GOD is there.. Where is scripture to back me on this? Or am I wrong? Hello Della. I think Heb 10:24-25 is good but Romans 12 and 1 Cor 13 show that we cannot serve God isolation as there are over 100 one anothers in the Bible. No believer in the New Testament was ever out of fellowship with the church, the Body of Christ, so you are not wrong. We are not to forsake the assembling of ourselves and ask him what is it about church he doesn’t like. He wants to love God but not be around God’s children?! I don’t go to church for music,i have been a musician most of my life and can easily lay music aside when I go to a church but I’m amazed at how important some people think it is. Hello Rachel. Since you are still under your parents care, I would do as they ask. they have more years of wisdom and experience in these things. I believe that you should do as they say and just wait until you get older and they will trust you with your decisions. For now, part of honoring our father and mother is doing what they ask and not arguing. God is most pleased with this. Previous post: What Happens Right After You Die? Next post: Who Are The Principal Patriarchs in the Bible?